The 10th Romanian Film Festival in London: TURNING THE PAGE brings you the latest, the most exciting and the most illuminating productions from the ferment of the Romanian film industry. Hugely popular actors and immensely insightful directors will lend their presence to the screenings within the 10th Romanian Film Festival in London: actor Victor Rebengiuc (Japanese Dog), actor and director Horatiu Malaele (Happy Funerals), actor Bogdan Dumitrache (When Evening Falls On Bucharest Or Metabolism), actors Dragos Bucur, Alexandru Papadopol and Dorian Boguta (Love Building), director Stere Gulea (I Am An Old Communist Hag), and director Adrian Sitaru (Domestic). Join us on the red carpet! 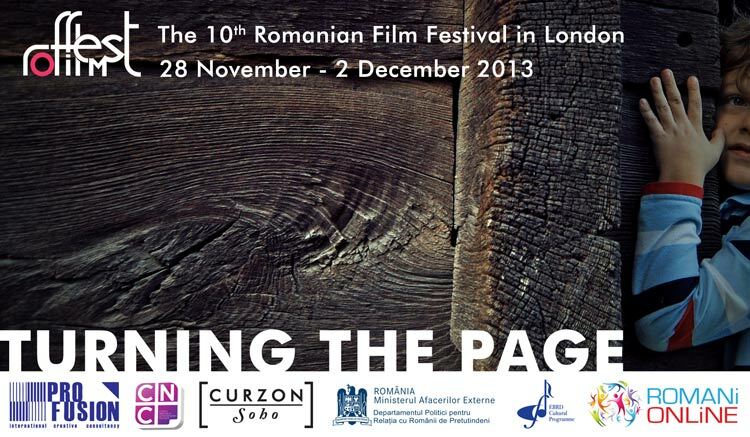 The ROMANIAN FILM FESTIVAL IN LONDON (RFF) is gearing up for its 10th edition, which runs from Thu 28 Nov – Mon 2 Dec 2013. Save the dates for our 5-day celebration of film! Join the festival Facebook page http://Facebook.com/RoFilmFest for some great news, competitions and prizes, your chance to meet the top actors and directors invited, and more!